fireman is the latest release of mega star mammotty. 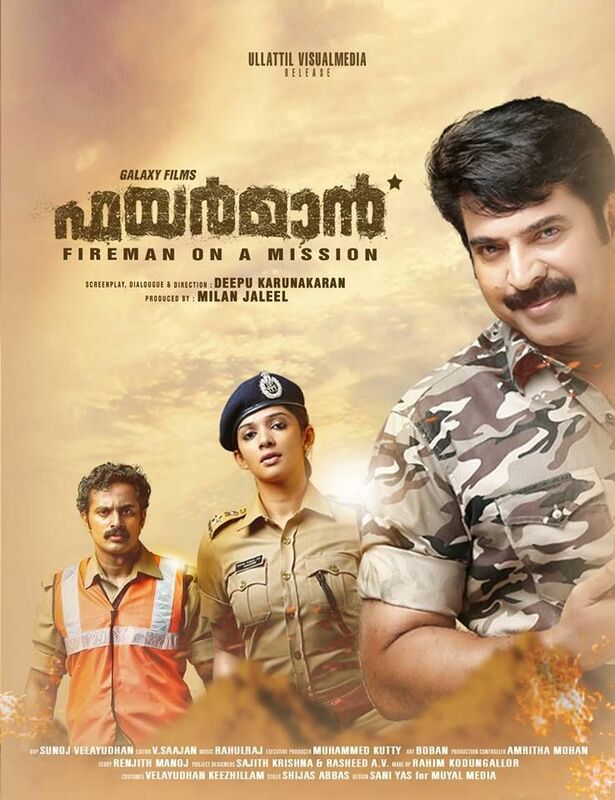 this mammookka’s very first release in 2015. fireman is one of the most waited movie because of it’s theme. this movie is a thriller and its based on a rescue operation. fireman is releasing on thursday, 19th february 2015. fireman includes a big star cast, apart from mammootty lot of popular stars in this film. nyla usha, unni mukundan, siddique, andrea jeremiah, salim kumar etc are rest in cast. fans of mammootty is only expecting positive Fireman review. He is playing the role of a cop in this film. Vijay is the character played by mammootty in this film. nyla usha is playing the female lead role in fireman. Mammootty’s recent release was varsham, it was a box office success film. After a short gap another mammootty movie is coming to theaters. fireman movie trailer created good responses all over. within short period record number of views come for the trailer of fireman. galaxy films is the banner producing this movie. Thappana was the last mammootty movie produced by galaxy films. expectations are very high for fireman because of the trailer and and first look posters. this is the very fist time director deepu karunakaran is getting the date of a big m. unni mukundan is playing an important role in the film fireman. unni mukundan recently acted with mammootty in the film rajadhi raja. satellite rights of fireman is already sold to surya tv and fireman is expecting on television during onam 2015. fireman will be a onam 2015 film for surya tv. post your review and comments about fireman movie here. you can discuss about the film fireman here. all the best wishes for the malayalam movie fireman. jayasurya’s aadu oru bheekara jeeviyanu is the other film releasing on 6th february 2015.
we are waiting for fireman, this will be a good film. its a fine thriller, mammootty back on track . watched the movie fireman, its a well executed thriller. never expected such a theater experience, after traffic a true thriller.